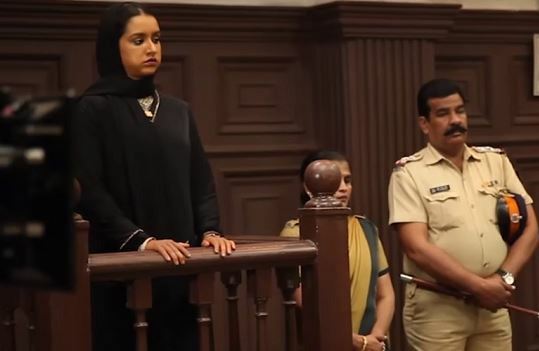 Haseena Parkar does something remarkably impossible; a love song in a court scene. But hey that was a flashback! Yeah, flashback and a court case go hand in hand in this film where, mind you, the writers don't waste time in dealing with insipid details of the case, cough up proof or show us glaring evidence against Haseena - the lady with chubby cheeks. Instead, we get to see a song (actually two of them), her relatives, her circumstances, her gali, mohalla and everything that tries hard to earn her a bonafide certificate. Sniff sniff, how emotional! The courtroom debate gets so irrelevant that the judge comments, ‘Hum in par novel nahi like rahe (we are not writing a novel on her)’. The defendant’s lawyer gets so exasperated with this story-telling that he observes, 'This is frivolous.' Not in the history of frivolity has the word frivolous sounded so convincing and so befitting! Chubby Cheek’s character is also very interesting. It doesn’t change in a linear fashion. It shifts from being fierce to coy to aggressive to assertive at such a quick pace that you wonder why you should spend so much money at Ferrari World roller coasters when you can have the same thrill in just 40 dirhams! Chubby is sometimes so naïve, sometimes so independent that the film could easily be called Kabhi Calm Kabhi Krodhi. Even their idea of krodh is pretty maverick. Like how she fights at the chawl’s tap on water issues is applause worthy. She even punches a goon at a restaurant who refuses to pay his bills. From a mere spectator to Fearless Nadia, Chubby shows us so many shades that she can now easily be the brand ambassador of Asian Paints. How these small mohalla fights make her one of the most sought-after unofficial arbitrators of her area, is established really well! There is no build up, no repression, no smart planning. All the makers do is smartly place the camera at her feet, take a low angle of Chubby perched on a huge sofa, making her look like a sumo wrestler and voila! Power established! In another scene she tells her brother, how even after her marriage, she can’t step out of the house without a burqa. Awww…so sad! Such restrictions on women. Chee!. This becomes even sadder because in the previous scene, she had gone to the market without a burqa. This dreamy, almost amnestic trait of Chubby makes her even more endearing. This cute randomness is well in sync with the script of the film. For instance, we are told (only once though) that Chubby’s husband is obsessed with cleanliness. Why? Characterisation bro, come on! Speaking of which, we have wonderful characters tumbling straight out of a cookie cutter; an NRI investor mouths ‘This Country Man’ with much disgust, a drug addict wears red kajal to look the part. Gosh, aankhen bhar aayi meri! From playing the usual glamorous girl to essaying the role of a gangster, Shraddha Kapoor has come a long way. She deserves two Ferrero Rochers for her performance. Or wait! She already has them, hiding under her cheeks. Her face is so swollen in the movie that she could barely open her mouth to say her lines. I feared words would accompany bundles of cotton as she mouthed her dialogues. 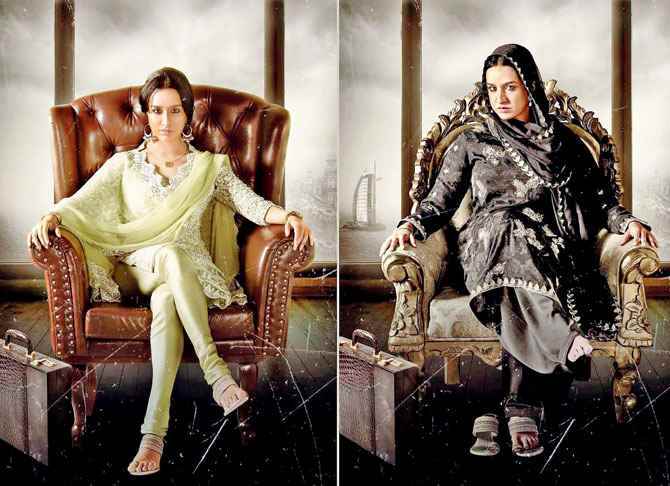 The film manipulates audiences to sympathize with Haseena Parkar. The crowd calls her desh drohi, she complains her children haven’t had food for a week, that she is facing interrogation from both, the police and her family. 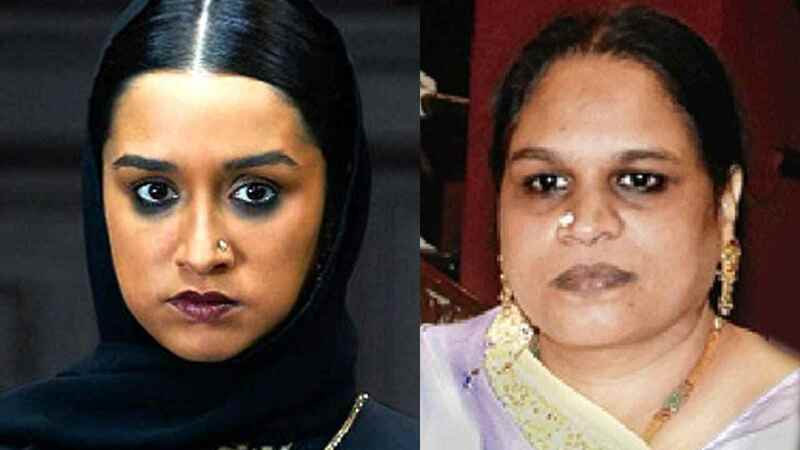 Most of all we are expected to feel sad for her because she faces injustice by the virtue of being Dawood Ibrahim’s sister, the same name she uses and abuses, in numerous extortion cases. Tch tch, so sad, really!